There is a neighbor who calls me to her house in the dark of the morning. I’m to take her place when she is gone. She is gone. It’s a sweet place, like the sad spot in the middle of a pound cake. There is coffee with half and half. There is a library with favorite novels I do not own myself. I take them down, sit at the kitchen table and offer thanks to the Lord for making such a neighbor. Wonder of wonders. An hour of stillness, then a rustling upstairs, a thump, a giggle, a hush. I reread the same line over and over. They want to watch me awhile. They move as a unified front down the steps, then spread out and advance, behind one chair to another to a beam now dropping to the floor. I don’t notice. I don’t hear them. I let them come till at last I look up in surprise to see four little faces around the table. The girl grins but the boys look as if someone let a banshee in the house, fascinated, wary, except for the smallest who has Down Syndrome. He looks at me like Christmas morning come early. Breakfast? I say and they all jump. The love I have for these children is natural. I can imagine the whole time that I am their mother or big sister and this is our morning game. But Jesus loved the wholly set apart from himself: you and me. He did the sneaking up on all of us and invaded our narrow inner circle. The love of the Trinity was so great that it overflowed, as the morning stars sang for joy, and spilt over to the lowest pits and dry wells of the earth. These little people are my neighbors and by the end of the day they will manage to have me chasing them around the house with my eyes closed. I’m no good at this game, but to have the girl rolling in laughter and boys sympathetically patting me on the head is worth the bruised knees and sore bones. Then there is the neighbor who asks me to scoop the litter box she herself hasn’t cleaned in weeks, the neighbor who literally throws his trash out the nearest window, the neighbor who brings alpaca toenail fungus for me to examine, the neighbor who occasionally leaves tamales at the gate as penance for his bad behavior, the neighbor who fires an actual cannon on gentle unsuspecting evenings, the neighbor from the west who calls on me for rescue, the neighbor from the east who has rescued me. Months go by when the only thing we can do for one another is mark our leavings and returnings, when all we can have is the decency to stop and look and remember their existence as they remember ours. I came back home last week from Charleston, South Carolina, where I saw places I’ve had a mind to see for some time. I was traveling with friends who have a great capacity for appreciating both the grand and the common, not good company, the very best. Through the small towns, every street name was read and considered. We drank deep of the land at the tea plantation and vineyard: Charleston Breakfast, Earl Grey, Chardonnay, Cabernet Sauvignon and more. We pretended like Middleton Place was our own, and condescended to share with the thirsty, as long as they would walk through the world like it was something to see and not something to move past. But of all the beautiful places my favorite was a humble spring on the way home in Blackville. Every old person has at least one story about a spring, but I had never seen one… and this one in particular was said to have healing waters too. We stopped to ask for directions from the stylish librarian who whispered the way but had never been there herself, either not believing the claim or having no ailments. As for me, I believe in all the articles of the Christian faith. I am certainly capable of believing in the fantastic, miraculous and out of the ordinary, though I rarely expect it. But I can testify that it rushes from the deeps there in Blackville, for around the ten iron pipes sticking out of the ground and steadily pouring cold water beside a little creek was a group of colored women laughing, dancing and soaking wet. We approached just as we were, travelers a long way from home, shy and strange, unfit for the inner circle. This wasn’t like the grand plantations, where we paid to come, joined sightseers and listened to well done spiels from tour guides recently here from the Bronx. This was a deeply personal place, at least at the time of our approach. It was free but costly. Everyone was quiet, except the spring. It sounded between us, making introductions, thirsty one to thirsty one, weak and wounded, sick and sore, believer. We watched and listened and smiled to one another, yet unsure. So tell us about this place, I said, remembering all the people who’ve opened the door for me. Do you live around here? Allendale, one lady offered and then the eldest told the story of the spring, beginning with her own childhood, ending with a motherly come taste it and the glade bubbled with laughter and silliness again. We filled our mason jars, drank from cupped hands and splashed the water to our sticky faces. Allergies, eczema, arthritis, everything, honey the lady said. Mama would even wash my hair in it. And you see that? she pointed to a mark in the tree. What does that look like? An ear. God is listenin’ here, she said. The fact that he listens everywhere, not just in Blackville, is beside the point. The water was sweet and hard with minerals, like the wells we were familiar with, as distinct in their reservoirs as casks of wine, like every small town street, every neighborhood and country road. Maybe it is healing. Who am I to say? Maybe I would have died by now if it weren’t for that drink. But it’s no less wonderful if it’s not, maybe more so. Who ever heard of simple water bringing such joy? To sneak up on a banshee, to be happy on Christmas morning, is one thing, to be thrilled by and loving to a plain, old neighbor implies a thirst and interest only capable in a masterfully created mind and a world of meaning yet untapped, deep and wide, as sweet as the sad spot in the middle of a pound cake, as inexplicable as a welcome bruise. Anything that can bring people together like that is healing, my friend said, as we made our way back to the highway, back home to the men who us watched go, to the women who share our water, to the neighbors who would drink our tea and wine more often if it ran over like the love of the Godhead, like the spring still pouring out in Blackville, South Carolina. I once wrote lightheartedly about my decision to not go to college and live at home helping my family, but there was a lot more to it than that. “Telling a story is like reaching into a granary full of wheat and drawing out a handful,” Wendell Berry writes in one of my favorite novels, “There is always more to tell than can be told… there is also more than needs to be told, and more than anybody wants to hear.” I am ever conscious of this when I wrestle with words as with a gar fish, fighting the line for hours only to throw him back because nobody wants to eat him or even thinks he’s pretty. But the fisherman and the writer will go on wrestling because the only thing that fights harder than the words you throw back are the words you keep. And the only thing that fights harder than the ideologies you reject are the ones you espouse. I wrote lightheartedly back then because it was nothing but. I took a lot of grief for that decision. Then I started taking grief for other things too. I think it was Amy Carmichael who said we mustn’t be surprised when the way of the cross leads to the cross and my friend Lore Wilbert is famous for saying Fidelity to the Word of God and not to an outcome. We need to hear these things and frame them on our walls because the immediate path of our decision making won’t be paved, descending and shaded. Mine hasn’t been. It’s really been more like a walk in the fire swamp. Woe unto them that call evil good and good evil, as the prophet said, and this is what we’re up against: those who call shame honor and honor shame, those who throw under the bus what is sacred, like dignity, humility, submission, sacrifice and the freedom in Christ that a young girl has to pursue what’s been laid on her heart, even if it’s, heaven help her, a broken old fashioned home and a community full of all too unconscious sinners. I can write more seriously about it now because that was eight years ago. I believe I chose well in that crossroads not because I think higher education and familial independence are bad things or because I’m always delighted with my current status, but because I chose in good conscience. When I was little I was often told by my elders to find a place to light and I would go and try my darnedest to be still and quiet somewhere. Obedience to God and delight in His will, taking up our obvious duties, discerning new ones, using our passions and gifts unto wonder, love and praise— this is our place to light. This is where we can settle down, however unsettled. Every time I get discouraged there is mercifully a friend to say in their own unique way, He created a spot in the world for you, Sarah, and what they’re saying is it’s good. I can see now that one of the most important parts about maturing in Christ, especially as women, is sorting out shame and not-shame, the simple commands of a merciful God versus the heavy and unrealistic expectations of a billion not-gods. Christ came and died, rose again and now reigns, to give us freedom to obey His Good Word and worship Him, no longer slaves to sin, to what people think, to what everyone else is doing, to fear of the future, to love of money, to love of self, to fear of entropy, to convincing everyone of our love-worthiness, to endlessly attempting to atone for our own guilt, glory be. It takes a little time to grow into this freedom, like a young tree breaking through the canopy. It takes a little time for all these pitfalls and temptations to occur to us. About eighteen to twenty years, I’d say. And if we need help, Aunt Ellen is there. How will you marry a doctor and be rich if you don’t go to medical school? How will you show the world what women can do if you don’t go into the workforce and compete against men? How will you dress well, have a grand house and nice vacations if you don’t market yourself? How will you become somebody without changing drastically? Grilled at the Fourth of July picnic, served on a platter for everyone to pick at, shamed for things that are not shame and exposed to the judgement of lesser gods, you will surely be confronted with everything your heart could run after but the One Thing Needful. Who hindered you from obeying the truth? Paul asks in Galatians 5. Bound up in Christ, we can say nobody. Ain’t nobody able to do that. No sir. These things are on my mind because a friend of mine is graduating from high school this summer and we spent the day together recently. Her family owns a dairy and her grandparents could use her help and her parents left the decision to pursue college and a career at this time or not, up to her. She’s decided to do what I did, but I fully intended to talk her out of it. I was afraid she was following me, and that’s a broken mooring. She’s already met with opposition in her extended family, church and peers, but this small redheaded girl who is normally so laid back explained to me with passion that she believed staying home and doing the needed work was God’s will for her life. She had thought it out and made her decision in good conscience and she didn’t care what great Aunt Ellen said or anyone else for that matter, presumably myself included. I was driving when she said this and we both just kept looking straight ahead. I don’t think I said a thing, but what I thought was, Good.‘Cause girl that’s what it takes. She’ll cross her bridges when she comes to them. She’ll probably think more than once of running away and changing her name, and daydream about starting over someplace where people are more appreciative. She’ll struggle with resentment in her lowliness and bitterness toward her authorities. She’ll pray for deliverance out of her problems, and accept deliverance in them, ever so slowly. She’ll learn to prize courage more than safety through feeling very afraid. She’ll be chased out from beneath all her false hopes. When the outcome isn’t what she thought, suddenly looking back in eight years, she’ll forget her first love and worry. She’ll worry that God has put her on a shelf and forgotten her, even though she never forgets the cows at milking-time. Then she will be very very happy. Her joy will come upon her as gentle as fireflies, as surprising as summer lightening. In other words, my friend Rose will be like every other woman who chooses, despite the particulars of place of work and rest, mere Christianity. In her moment of deepest need Jesus will be nearest to her. Perhaps that’s not right, for he’s always nearest her. Her every-second has passed through him first, and in all her tomorrows he’s already there. But when her heart is emptied of all hope and security, Jesus will fill her as a dam breaks over a dry river bed, expanding the borders, those limits of her capacity to give and receive, moving stones, uprooting trees, till all that is left of her is a place on earth for Jesus to fill, which is what she was all along, only she’ll know it now. And so will everyone else. When his waters recede, she will be emptier than she was before and she will miss him more, and so her great perennial need will become a sign, like a thumbprint in a cookie, the One Good God in the soul of man. If in a little boat in the fog in the dark (with a fishing pole) isn’t the best way to send a graduate into the world, well I don’t know what is. Yet the ransomed will have their moorings aboard and an ever sure place to light. What is our certain calling? Blessed are we to be called to that which also fulfills our deepest longing: to have no gods before God and to love him with our whole heart, soul, mind, and strength. To have no higher allegiance than to God Most High, to seek no other end of all our actions but making His glory seen, and to have no deeper affection than for Christ who is our life. Whatever our lot, we have all we need to fulfill this calling through our knowledge of him who called us by his own glory and goodness. And the second calling is like it: to love our neighbor as ourselves. Question #3 in this remarkable Catechism by Alicia Akins you should read here. Mrs. Ruby walked to her dresser, opened a drawer and lifted the delicates, to reveal a selection of halloween candy, two cookies and a yeast roll, wrapped up in a paper napkin. This was her table for me, the only one she had. Not good enough, but good enough all the same. I took a Reese’s and a cookie and sat on her bed. The chocolate had turned white and the shortbread was stale. “Thank you!” I said, eating them up and she smiled. She didn’t have her hearing aids in, but she was watching me. “I’ve been saving them,” she said. Two years later, I was called into her hospital room one morning. “Please, would you try to get her to eat? She hasn’t taken a bite in two days,” her children said. I sat beside her and we talked awhile, just taking turns and nodding, because her hearing aids had been lost during surgery. “Not hungry?” I yelled, pointing to the covered dish on the rolling tray. “No, I’m not,” she said firmly. “They are putting medicine in my food and I don’t want it. A patient has rights,” she said, with that lovely thin finger in the air. I nodded my support and opened the cover off the plate. Her breakfast had grown cold. The grits were solidified and the scrambled eggs were too pale. Hospital food doesn’t exactly foster the will to live. I opened a little syrup container and poured it over the sausage and jellied the biscuit and started eating. Mhmm, I said. I looked down at the label. “No—” I said but with a smile and a nod, for the Greater Good. “Want some?” I offered her a bite from my fork, and she took it. Back and forth, we ate the biscuit. It was her last meal, and my last in her sweet company. It wasn’t great, but it was good. It was good to be together. Twenty years ago, I was lifted up onto a washer machine by my grandfather. He popped open a can of Vienna Sausage, and using his Old Timer pocket knife, offered me a bite. Even then, I had a general understanding of what real animals look like prepared for eating, and this clearly wasn’t one of them, but I opened up all the same. There isn’t much I can talk about with expertise or standing. In order to be professional at something at the age of twenty-six, you have to have been born into it. People sometimes ask me for advise on ministering to the elderly, often their own family members who won’t quite trust them for whatever reason. The best (and sometimes hardest) counsel I can give you is to eat with them. Eat their own food with them, whatever it is. It’s like any other kind of kinship. With all love there is an element of shame. Presenting our food is like nakedness, sharing it, an intimacy. Will they despise me, laugh at me? If you don’t understand this, you’ve never been a kid at a school lunch table, with a red cabbage burrito inside your lunchbox, surrounded by PB&Js on square white bread and lunchables. I couldn’t muster the courage to bring it out. I chose to starve. Food and shame, shame and food. With children and the elderly these things are just more upfront. They are fragile, closer to God. Yet loving them is simple. Just sit down and offer that toothless man who is so uncertain of what you think of him and so fearful of life and death, a sip of your milkshake. I do not like molds, dear reader. Or sugar-free jello, highly marketable for the elderly, or mini marshmallows or Red Dye 40 or food that comes home to linger for days after surviving a church social. Call me a people pleaser, but the only thing that sounds worse is hurting the feelings of a good woman. So I ate it, glad to find pineapple and pistachios there on the bright side, and felt the conviction that jello molds are, after all, not a thing intrinsically evil and thus capable of redemption in the fullness of time. But Aspartame will surely be put under His feet before the last enemy is destroyed. My grandfather lived with an abiding shame from the sins of his part in a demoralizing and confusing war. He never told me what happened on VC Hill in Vietnam. I learned many of his secrets before the end, even honorable things he covered over, but not that one. I thought for sure it would come, for he was, in his own words, like an old refrigerator, can’t keep nothing. But I was wrong. I expected confession and fear, but none came. I had the right answers about forgiveness and assurance prepared, but I didn’t need them. I was ready to run the distance between him and his God. Instead there was only a firm pressure on my shoulders, pushing me into a chair. Sit down. Almost two years have passed and looking back I occasionally wonder if I missed some moment of ministering to his spirit. Maybe he roamed over VC Hill while I was sleeping, but I don’t think so. He was peaceful throughout, but so quiet. Where are you? I wondered, watching the movement of his sleeping eyelids. If he was entering gloryland, all bright like the Mount of Transfiguration, why wouldn’t he say? But perhaps his response was what Peter’s should have been. Like Peter and myself, my grandfather had a big mouth and a fearful temper. I don’t wish to make light of it. Anger is a grievous sin, and putting people back together isn’t so easy if Jesus in the flesh isn’t standing right beside you. The last thirty years of his life, my grandfather became a faithful, active member of a church, setting himself apart from many generations of fathers and brothers who were too proud to submit to and serve a group of humans they wouldn’t care to go on vacation with, or any group of humans for that matter. But that doesn’t mean he didn’t hurt and get hurt in that church. Truth be told, there was a man he didn’t like and it was fairly obvious that man didn’t like him either. And that man was the pastor. He was much younger than my grandfather but he became sick and died several years before. His name was Jack. One evening on his deathbed, my grandfather did some talking. When this happened, everyone in the house would gather around and piece together his meaning and when it was over, I’d write it down. This time, he looked from spot to spot in the ceiling and on the far wall with recognition at a familiar, invisible face, as if they were truly there before him. No actor could have put on a show so thoroughly convincing. With one he giggled and made funny faces. It was too perfectly ridiculous to be one sided. That’s when it fully came to me that whatever he was seeing was as real as the world we’re part of. It was like the feeling of reaching into a laboring doe to readjust the position of the baby, expecting everything inside that secret place to be strange and untrue, then suddenly knowing in that otherworld the familiar form you’ve held a hundred times here in the shadowlands: soft hooves, bony knees, floppy ears… beautiful, just out of sight and nothing to fear. Perhaps it was Donny Willoughby he saw, his best friend as a child, or one of his brothers. Then he turned to look at a new face and said kindly Jack. What Jack? What’d you say? He looked as if he was straining to hear, eager to listen, as you would to the distant voice of a long-missed friend. My mother, who is never one to leave a mystery behind through delicacy got down in his face and said, Jack? Jack who? She said his last name, in question. My grandfather turned to her annoyed, interrupted. Of course, he said. Over the years I had joined the counsel of reasonable women to lecture him about his feelings toward Jack. We had the right answers and laid them on thick, and rightly so, but it didn’t amount to a hill of beans. So we washed our hands of it and secretly questioned the sincerity of his faith, to let an offense live so long. We women know how to handle these things. We don’t leave them laying around for people to see, like an over-stretched undergarment. But my idea of a fitting resolution to this distance between church members could not have been so glorious, no, nor so perfect as what God brought to pass in his infinite wisdom. What kind of storyteller expects anyone to believe the kind of things we see in this life alone? The threads of his work aren’t tidy, and sometimes they can’t be followed and they break off in all the worst places, but in the end you see it secure and whole, and not the dishrag you imagined at all, but a tapestry filling the whole world, with every scene more beautiful than the last, where those of a cool unfriendliness meet over a hillside and listen to each other, where sad old things have passed away and you feel a pressure on your shoulders… for it’d really be wise, my friend, to sit down for the sight of all the new things coming on. So I suppose you and I must draw our own conclusions. Do you like my mule? Isn’t she grand? Annie drew her for me. 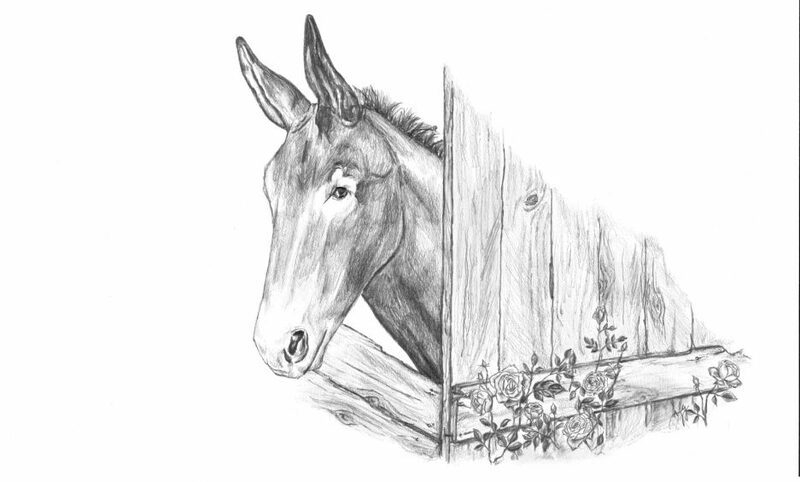 “I need a mule,” I told her in the church foyer, while the bells rang. “But just a simple one. It could even look like a donkey.” I like to say things like that to her, just to watch her face retain its serenity and composure. Annie is something special. Besides being an artist, she’s also a mighty fine seamstress, specializing in authentic reproductions for reenactors, and she’s the proprietor of a rare and vintage bookshop. She speaks thoughtfully, walks quickly, loves patiently, reads avidly and if you need a knife, she’s got one. She’s also one of my very best friends. I’d like to say welcome and thank you to the new readers, and the old ones, too. There are many other places you could be right now, in this land of a thousand doors, and I’m sure honored to have you here with me. I’m sitting at my desk. There is a vase of wilted daffodils and too many books, mostly ones I’ve read and can’t stand to put away. There is a mountain of laundry downstairs and a greenhouse that needs watering outside. I haven’t made my bed because a cat is curled up in it. I went to sleep last night thinking I needed to love people better than I do, and woke up wondering if someone left enough coffee in the pot for me. Somehow I feel the need, even in the ordinariness of my subjects, to warn you against thinking I have something you don’t. Your life is worth words, dear reader, and I hope that’s what you get from mine. In the loft of my parent’s house, I work part-time as a seamstress for an ultra-lightweight hiking apparel company. I do this in the evenings when everyone is asleep and I listen to podcasts, often about infectious diseases or conspiracy theories, which serve as a substitute for coffee. It’s hard to fall asleep on the job when the little grey cells are busy with the incoming news that Bigfoots (the correct plural) prefer Poptarts to just about anything else, and if I miss out on the history of hantavirus in Finland while the machine is going, I really haven’t missed anything. This is noise. It’s fun, sure, if you like that sort of thing. But it hasn’t produced anything in me, useful or beautiful. So I cut it off last night, to listen to the house I could live in blind on the dark hilltop, but it was freezing outside for the first time in many weeks, and all was quiet, even the spring peepers. I didn’t think of anything for awhile but the fabric and pattern, the razor blade and pins. None of the bearded men on Youtube need pins, but I do. I sat down to make the round stitch for the heel, then laid it on my lap to secure to the next piece for the final seam. After that, I could be done. That’s when I noticed all the seams on my overalls. I’ve never told you about the sewing before. There’s no shame in it, but as Reb Tevye said in Fiddler on the Roof, it’s no great honor either. I’m thankful for the job, but it’s just a job, and one that doesn’t bring me into fellowship with people who have stories. Except for when, in the quiet of the loft, I see that it does. It is no great thing to be an invisible worker, just one of many thousands at a post in an assembly line or a girl winding a bobbin in a dark house, unless people are born naked. Look down at your seams dear reader for a moment and remember that “our common life depends upon each other’s toil,” as the Book of Common Prayer says, and consider how the life of that seamstress has touched your own and answered your want, and how the work you do not love to do, might be the most needful. I spoke to a young woman in a parking lot one day last week. She was there to have an abortion. How old is your baby? I asked. Eight weeks, she said. Can I ask you.. why? But is it alright to kill a person we don’t want? She cursed me, sufficiently and repeatedly with a four letter word I don’t even know the meaning of. I was still there when she came out again. She had taken a pill in the office and it was already working on her womb, changing the atmosphere into a hostile place. The slip of paper in her hand told her what to expect after Pill Number Two, told her not to look in the toilet. If she did, I knew what she would see. Oh, would she look? Would she see? She turned to me. Do you want my baby? she asked. I only nodded, because I did want her baby, but I sensed a lack of sincerity in her voice. Well, here you go, she said, and pulled down her pants to expose herself. She made the space between us inhospitable, because she didn’t want me either. This parking lot belongs to a large brick building in a nice part of town, a prosperous old Southern town, home of one of the most prestigious golf tournaments in the world, and about thirty people, not guilty of any crime, are killed and put in a freezer here every day. I drive past it all the time, and did today, as I took an elderly friend to the doctor, where there was a new form for her to fill out, including the question, “Have you been abused?” I cringed at the sadness of the question, and wondered what she would say, how far back her mind might go. Now, this woman has been hurt. Not a year out of eighty five has gone by without a personal injustice, and some held a good deal more than others. But somehow, at some point, she was given eyes to see the hurt she herself had done looking back at her. You are the man as Nathan said, and with those painful words the hard-hearted king became a shepherd boy again. I have never been a mother, not even for a moment. But I’m glad to be a woman. I’m glad to be that part of creation made for the sake of man, and able to bear mankind. I’ve always believed it the greatest honor. Every month my body prepares itself for company, then cleans house only to prepare itself again. We biologically make welcome, and if we can’t for some reason, it concerns us. Unless we in our autonomy do it to ourselves. We fight to keep it legal, but no amount of legislation under the sun could make it right. I was in a big house yesterday, all richly furnished and clean. I was keeping the people, an elderly couple and a baby. The old folks slept, laid flat back on recliners, snoring. I sat in a rocking chair with the little girl asleep in my arms. She had hold of my hair so I wouldn’t lay her down. The afternoon light was coming through the blinds all golden. It had been raining and was going to rain again, but now the sun had come to set fire to the little dust motes no one was there to watch but me. There is something here, I thought, no, something missing. Someone missing. It was the woman of the house. I was just the help, yet here I was in the magic hour, keeping peace, witnessing the stillness of the sun between rains shining on the dust motes. It wasn’t right that it should be me, but that’s okay, because they weren’t paying me enough. Nobody wants to keep house anymore. Nobody wants to rock the baby. On the main road near the abortion mill, a beautiful woman stands with a sign most Saturdays. Her name is Mrs. Eva, and sometimes I stand with her. She usually tells me to go away, for the cold wind whips like nowhere else in the world around that building. You are too skinny to be out here! she’ll say, as if she wasn’t eighty-two. In Mrs. Eva’s presence, I often feel like my niece Adah, who wants always to be held just at dinnertime when my hands are busiest. Hold you, she’ll say. After hearing no a few times, she just valiantly climbs up my legs, and lo and behold, we find I can put dinner on the table and hold her at once, just as she suspected. Mrs. Eva stands for the unseen ones who enter the brick building and come out again in bags to be hauled away, sold for parts or burned, according to their usefulness. What happens here has all been made real to her. She sees them. I seldom have the eyes or strength to look, but I do see her. Mrs. Eva is a holocaust survivor. She did survive, just barely. At the age of nine, she was ripped from her home, forced on a train and into an extermination camp in Yugoslavia, where she witnessed and suffered unspeakable things. These abusers didn’t want to actually put the knife to the unwanted throats. No, they would just remove all subsistence behind walls where no one could see for reasons that sounded excusable at the time. She says there comes a moment, in your helplessness, when you can no longer watch what is happening, when the anguish is so great it will drive you insane, and all you can do is cover your eyes and try to run or hide. But if you survive, you will grow up and in some ways, you will recover. You will put on strength, God helping you. And then… then what? Well, there are lots of options for victims available today with a whole menagerie of hashtags. Or you could be like Mrs. Eva, who moves her old feet to the cold floor of a Saturday morning only to stand on a busy road to be cursed and spit upon, who feels the bitter wind up her spine and tells me to go get warm, who would be first to say I’m sorry, please forgive me, and come on in, who has, with all her cares, held my hand in the winter rain and prayed for me. I’m not a political activist. I don’t keep up with all the latest. Big things can happen in this world and I won’t know about it until I read the newspaper while mulching the garden six months later. I spend my days with the dying generation who remember as in a dream a place where men looked out for women and women looked out for children and children looked out for the stray cat, and that all sounds pretty good to me, and a long time gone. I’m just an American girl, a product of public schools, Disney and on a good day, Hank the Cowdog. But I’m also a storyteller. If there’s a tidy moral to these narratives, it isn’t yet obvious to me. I’m just here to tell you what I’ve seen lately in the parking lot, the waiting room, the big house and on the roadside. Maybe I do have something to say, a conclusion, however unoriginal: If you are a woman, be a woman. If you have a home, keep it. Don’t think you’re too important to witness the dust motes in the afternoon sun. If your mind is turned to the ways you have been hurt, consider longer the ways you have hurt others. And if you are a mother be a mother. Make welcome. I confess I am afraid to deliver these words, for the internet is like an over-grazed pasture, and I’ve always been one to step in it. A group of us were talking about fasting the other day, and how important it is to be capable of giving up something, even something lovely and lawful, for a time, to give yourself to other things. Mrs. Mary taught me to love tea. I’m sure you’ve heard the saying that if you want someone to love the truth, you must tell them a story. Well, that is what Mrs. Mary does. She’s never said anything about tea in itself— the health benefits or the history and nobility of the art, for instance. She offers no defense. She simply asks me, and asks me again and again, throughout the seasons of the years, to come in. Come for tea, Sarie, she says, and let me show you love and real comfort. Her idea of tea is a feast. In every way, she feeds you… in the place settings and the smells and in the stacks of books piled up everywhere around her house, I leave full. But even on days when it’s just a quick solitary cup while milking in the barn, it was Mrs. Mary who taught me to enjoy the taste of the tea itself, apart from the cream and sugar, and of the beauty of the vessel and the warm feel of it in my hand. And it was she who taught me, by giving her time, that it is not a waste of time. I did something uncharacteristic and remarkably grownup yesterday and looked ahead on my calendar. And— lo and behold!— today is National Hot Tea Day, in case you didn’t know. And although I’m usually at odds with government level decisions, in general and particular, I would have to say that this one sounds like a jolly good idea. So please make yourself a cup, or better yet, a pot, and have a spot with me today in honor of Mrs. Mary. There are, indeed, days when I fast from this good thing, but it’s not this day. I keep just one type of journal, which is mostly prayers and the same prayers over and over, with no juicy details or anything, and so fairly uninteresting. But occasionally I’ll write down bits of dialogue or more story-like thoughts. I’ve brought some of them here for you. It was a lovely year. It was a confusing year. Looking back, I can’t help but think of my Nana Betty’s oft-used words, “My, my, my! What a mess!” But setting out on this new year, the wisdom of an old school teacher also comes to mind, “Sometimes, honey, you’ve just got to tuck your ears back and dive on in!” So here’s to that, dear reader, because life is short and precious. It is not uncommon for us to begin the new year with such bright-eyed optimism. We sat on the bed in the spare room, and threw away paperwork— His, not ours, so it was easily done. Mrs. Alice had a whole conversation with herself in grunts and humphs. “Nah, I got this,” he said. We were on the way to a lakeside club house, just the two of us. He was the guest speaker of the banquet, and we were all dressed up. As he pulled into the drive, I panicked. “You? You’re the franchise,” he said. Well, he really did have it. I was so proud. He made the history of blueback herring sound fascinating, from start to finish. It was a triumph. For me, as well. You ever need someone to be the franchise, I’m your girl. After planting potatoes, we mulched them with old rank hay, to keep the weeds down. About half-way through the process I started to cry. Then I got angry and did some kicking and creative swearing. I finally worked myself into a better state of mind by the last wheel-barrow. I guess there is travail in every good thing this side of resurrection. Behind each heaping plate of mashed potatoes, there is a farmer, blowing dirt from his nose and wincing from a pinched, sunburned shoulder. She turned sixty-one today. I was cleaning the milking pail in the kitchen sick when something hit the glass of the window. The house is built into a hill, and so the kitchen seems to be on the main level when approached from the front, but it’s second story from the side, and third story from the back. Anyway, the window is high up there. I lifted myself onto the sink rim to look down and saw her standing there on the ground. I ran over to the round hallway window and popped it open. Somehow we always forget that these grim words habitually proceed the actual finding of fish, the coming of Fall and the general health and welfare of the offspring of fishermen everywhere. I enter the doors of Walmart only for those I love who won’t accept this fact by any other means. We got body powder (check), cat treats (check), baby dolls for the great-grand-babies (check), Special K (check), ice cream (check), cookies, frozen pizza and a can of refried beans (not listed). I was with Ruby all day in the ER. Georgia came. We hovered over her a long time together, willing her eyes to open. It was like the day I searched for my favorite dog, and imagined over and over again his answering bark. You can picture it all, and how it should happen, you know. But nothing. Then just at the last, she really did open her eyes on us. “Ahhh!” she said in that Norwegian way, a delighted, eloquent sound. It was like how we will meet again one day. I just returned home from Tennessee. It was wonderful. But there’s no adventure as satisfying as the lifted up and swung around kind of hugs of coming home. I was profoundly glad to see them, and I was glad to see it. There are few things in this world as beautiful as the Tennessee river, all green on the banks under a dark sky, but it still didn’t give me the shivers like the sight of our turnip field. “The trustees of an institution are those who have forgiven it,” Andy Crouch said from the stage, and everyone scribbled it down as the room stirred with the memories of broken homes and churches. I thought of how close and how often my family has come to collapse, in all the anger and all the hurt and all the selfishness. This tangible home has been God’s grace to us, enfolding a fragile institution, a place on earth to lay our heads when they throbbed, to hold us when we couldn’t hold each other. This place has kept us long enough to see the day of reconciliation— to see my eyes, the barometer of our condition, weep, swell, recover and smile again. The pain would ease and we could reach for each other once more. I know it’s just a cobwebbed ceiling and mud-tracked floor. I know it could burn up tomorrow, and I’d be just fine. But I also know that I have a run-away heart, and this place with the hundreds of ravines, animal stalls and trees to fly to, has kept me here, where I have been best tested and refined. Here, where I can be faithful by showing up, to feed and clean and milk and wash and love. Maybe that’s just my story, but I’m beginning to think it’s a good one.